The Battle of the Alamo was a nineteenth century battle between the Republic of Mexico and the rebel Texan forces during the latter's fight for independence during the Texas Revolution, also known as the Texas War of Independence. It took place at the Alamo mission in San Antonio, Texas (then known as "San Antonio de Béxar") in February and March of 1836. 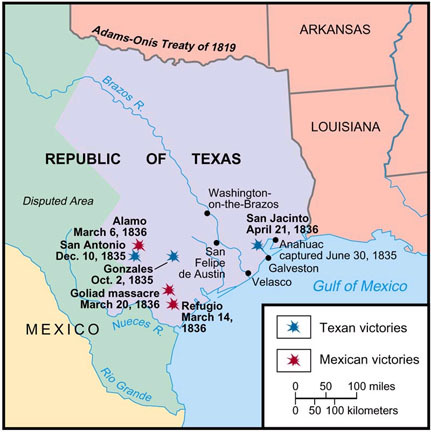 The 13-day siege ended on March 6 with the capture of the mission and the death of nearly all the Texan defenders, except for a few slaves, women and children. Despite the loss, the 13-day holdout stalled Mexican forces' progress and allowed Sam Houston to gather troops and supplies for his later successful battle at San Jacinto. Approximately 189 defenders were attacked by about 4,000 Mexican soldiers. The battle took place at a turning point in the Texas Revolution, which had begun with the October 1835 Consultation whose delegates narrowly approved a call for rights under the Mexican Constitution of 1824. By the time of the battle, however, sympathy for declaring a Republic of Texas had grown. 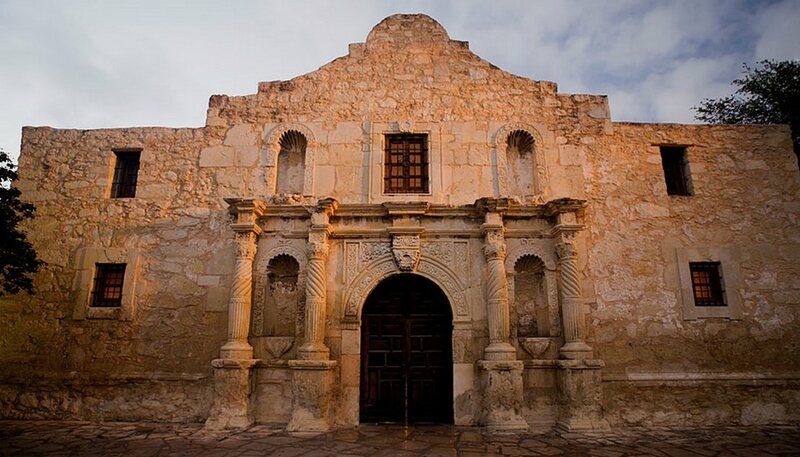 The delegates from the Alamo to the Constitutional Convention were both instructed to vote for independence. The deaths of such popular figures as Davy Crockett and Jim Bowie at the Alamo contributed to how the siege has subsequently been regarded as an heroic and iconic moment in Texan and U.S. history, notwithstanding that the Alamo fell. Texas' independence and its eventual union with the U.S. would have been unlikely had Mexico succeeded in its plan to reassert sovereignty over the territory, which later would contribute enormously to the U.S. economy. The Fall of the Alamo (1903) by Robert Jenkins Onderdonk, depicts Davy Crockett wielding his rifle as a club against Mexican troops who have breached the walls of the mission. Texas was part of the Mexican colony of New Spain. After the Mexican independence in 1821, Texas became part of Mexico. In 1824 it became the northern section of Coahuila y Tejas. January 3, 1823, Stephen F. Austin began a colony of 300 American families along the Brazos River in present-day Fort Bend County and Brazoria County, primarily in the area of what is now Sugar Land. In 1835 the Mexican President and General Antonio López de Santa Anna Pérez de Lebrón, (known as Santa Anna or Antonio López de Santa Anna) abolished the Constitution of 1824 and proclaimed a new constitution that increased the power of the Presidency and reduced the power of provincial governments. 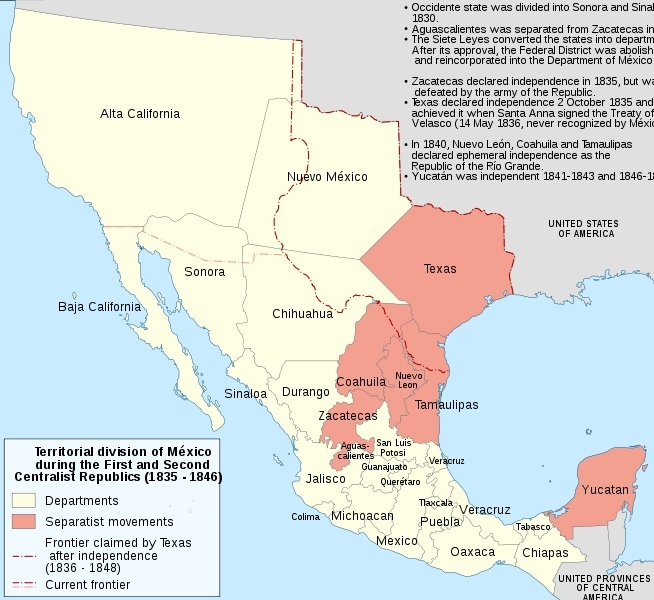 Since the end of hostilities with Spain ten years before, the Mexican government generally and Santa Anna in particular, had been eager to reassert control over entire country and control of Texas. This was seen as important as Santa Anna perceived the province to be vulnerable to America's westward expansion, which was in fact the case. Mexico's new interest in Texas was not popular with the colonists, who felt themselves to be more economically and culturally linked to the United States than to Mexico. They were also used to the relative autonomy they enjoyed under the old Constitution of 1824. Santa Anna's increasingly ambitious seizure of dictatorial powers under the new constitution was causing unrest throughout Mexico. Hostilities in Texas began with the Battle of Gonzales, October 1, 1835 after which Texan rebels quickly captured Mexican positions at Goliad (La Bahía) and San Antonio. After the surrender of General Martín Perfecto de Cos and his garrison at San Antonio, there was no longer a Mexican military presence in Texas. Santa Anna decided to launch an offensive to put down the rebellion. Minister of War José María Tornel and Maj. Gen. Vicente Filisola (1789–1850) proposed a seaborne attack to Santa Anna, which would have been easier for the troops. Since 1814, sea access had been the proven means of expeditions into Texas. Santa Anna refused this plan because it would take too long and, in the meantime, the rebels in Texas might receive aid from the United States. Santa Anna assembled an estimated force of 6,100 soldiers and 20 cannons at San Luis Potosí in early 1836 and moved through Saltillo, Coahuila, towards Texas. His army marched across the Rio Grande through inclemental weather and snowstorms to suppress the rebellion. San Antonio de Béxar was one of his intermediate objectives; his ultimate objective was to destroy the Texas government and to restore rule of the central or "Centralist" Mexican government over a rebellious state. He had already suppressed a rebellion in the state of Zacatecas in 1835. Santa Anna and his army arrived in San Antonio de Béxar on February 23, a mixed force of regular infantry and cavalry units and activo reserve infantry battalions. They were equipped with British Baker and out-dated, short range but effective and deadly British Tower Musket, Mark III, or "Brown Bess" muskets. The average Mexican soldier stood 5 feet, 1 inch; many were recent conscripts with no previous combat experience. Although well-drilled, the Mexican army discouraged individual marksmanship. Initial forces were equipped with four 7 inch howitzers, seven 4-pound, four 6-pound, four 8-pound, and two 12-pound cannons. Many Mexican officers were foreign mercenary veterans, including Vicente Filisola (Italy) and Antonio Gaona (Cuba), while General Santa Anna was a veteran of Mexican War of Independence. Battle of the Alamo. state.tx.us. Lieutenant Colonel William Barret Travis now commanded the Texan regular army forces assigned to defend the old mission. In January 1836 he was ordered by the provisional government to Alamo with volunteers to reinforce the 189 who were already there. Travis arrived in San Antonio on February 3 with 29 reinforcements. He became the post's official commander, taking over from Col. James C. Neill, who promised to return in 20 days after leaving to tend to a family illness. Other men also assembled to help in the defensive effort, including a number of unofficial volunteers under the command of Jim Bowie. Travis and Bowie often quarreled over issues of command and authority but as Bowie's health declined, Travis assumed overall command. Bowie, after whom the "Bowie" knife is named, was already famous for his adventures and knife fights. At that time, the siege of Alamo was seen as a battle of American settlers against Mexicans but many of the ethnic Mexicans in Texas (called Tejanos) in fact also sided with the rebellion. This struggle was viewed in similar terms as the American Revolution of 1776. These Tejanos wanted Mexico to have a loose central government and supported states rights as expressed in the Mexican Constitution of 1824. One Tejano combatant at Alamo was Captain Juan Nepomuceno Seguín, who was sent out as dispatch rider before the final assault. Defenders of the Alamo came from many places besides Texas. The youngest was Galba Fuqua, 16; one of the oldest was Gordon C. Jennings, 57. The men came from 28 different countries and states. From Tennessee, a small group of volunteers led by the famous hunter, politician and Indian fighter Davy Crockett accompanied by Micajah Autry, a lawyer. A 12-man "Tennessee Mounted Volunteers" unit arrived at Alamo on February 8. Davy Crockett had resigned from politics having told the electorate that if they did not elect him they could go to hell and he would go to Texas! The "New Orleans Greys," came from that city to fight as infantry in the revolution. The two companies comprising Greys had participated in the Siege of Béxar in December. Most Greys then left San Antonio de Béxar for an expedition to Matamoros with the promise of taking the war to Mexico, two dozen remaining at the Alamo. The abrogation of the Constitution of 1824 was a key trigger for the revolt in general. Many white Anglo-Saxons in Texas had strong sympathies for independence or for union with the United States. Some may have wanted a return to the Old Constitution that had allowed them a large degree of self-determination. When the Texans defeated the Mexican garrison at the Alamo in December of 1835, their flag had the words "Independence" on it. Letters written from Alamo expressed that "all here are for independence." The famous letter from Travis referred to their "flag of Independence." Some 25 years after the battle, historian Reuben Potter claimed that reinstatement of the Constitution of 1824 was a primary objective, and Potter's comments have also been the source of a myth that the battle flag of the Alamo garrison was some sort of Mexican tricolor with "1824" on it. Another main factor behind the revolt was the fact that Santa Anna had abolished slavery in Mexico. This was a serious setback to many landowners, who now faced financial ruin. Texan independence or joining the Union would allow these people to retain their slaves. As a slave state, Texas would support the Confederate States of America during the American Civil War. 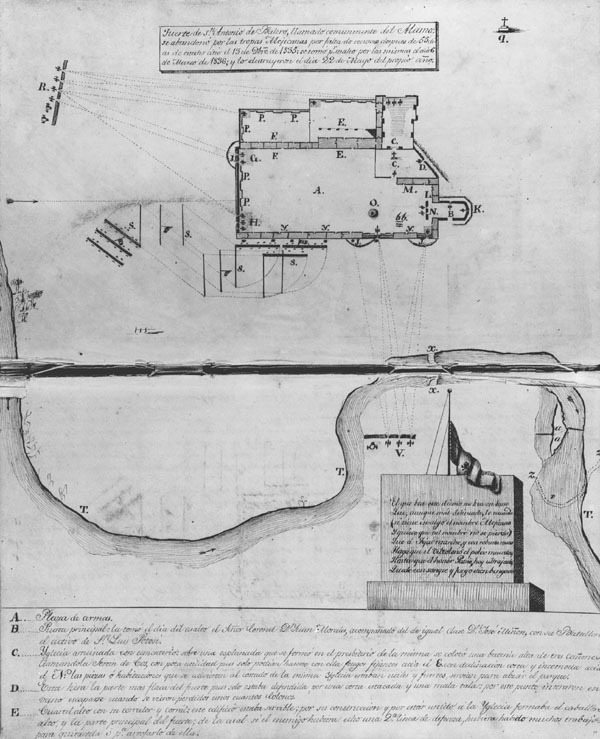 (Right) This attack plan for the Alamo was created by José Juan Sánchez-Navarro in 1836. Places marked R and V denote Mexican cannon; position S indicates Cos's forces. Lt. Col. William Travis was able to dispatch riders before the battle of March 3 informing the Texas provisional government of his situation and requesting assistance. Sam Houston's Texas Army was not strong enough to fight through the Mexican Army and relieve the post. The Provisional Texas government was in disarray due to in-fighting among members. Travis sent several riders, including James Bonham (1808–1836), to Colonel James Fannin for help. Fannin (1804–1836), commander of 450 Texas forces at Goliad 100 miles southeast of Alamo, attempted an unorganized relief march with 320 men and cannon February 28 to Alamo, but aborted the relief column due to poor transportation. Most men were slaughtered by a Mexican force after surrendering (the "Goliad Massacre"). March 1, 32 Texans led by Capt. George Kimbell and John W. Smith from Gonzales, slipped through Mexican lines and joined the defenders inside the Alamo. They were the only response to Travis' plea for help. The group became known as the "Immortal 32." A letter written by one of the 32, Isaac Millsaps, details events inside Alamo on the night before the siege. At the end of 12 days the number of Mexican forces attacking was reported as high as 4,000 to 5,000, but only 1,400 to 1,600 soldiers engaged in the final assault. Approximately 6,500 soldiers had originally set out from San Luis Potosí, but illness and desertion had reduced the force. The Mexican siege was scientifically and professionally conducted in Napoleonic style. After 13-day period the defenders were tormented with bands blaring at night (including buglers sounding the no-mercy call El Degüello), artillery fire, an ever closing ring of Mexicans cutting off potential escape routes, Santa Anna planned the final assault for March 6. Santa Anna raised a blood red flag which made his message clear: No mercy would be given for defenders. Lt. Col. Travis wrote in his final dispatches: "The enemy has demanded a surrender at discretion otherwise the garrison are to be put to the sword, if the fort is taken—I have answered their demand with a cannon shot, & our flag still waves proudly from the walls—I shall never surrender or retreat." The Mexican army attacked Alamo in four columns plus reserve and pursuit and security force, starting at 05:30 AM. The first column of 300 to 400 men led by Martín Perfecto de Cos moved towards northwest corner of Alamo. Second 380 men commanded by Col. Francisco Duque. Third column comprised 400 soldiers led by Col. José María Romero. Fourth column comprised 100 cazadores (light infantry) commanded by Col. Juan Morales. The attacking columns had to cover 200 to 300 yards (200 to 300 m) open ground before they could reach Alamo walls. To prevent attempted escape by fleeing Texans or reinforcements entering, Santa Anna placed 350 cavalry under Brig. Gen. Ramírez y Sesma to patrol surrounding countryside. Texans pushed back one of the attacking columns but Perfecto de Cos' column was able to breach Alamo's weak north wall quickly; the first defenders fell, among them William Barret Travis, who was killed by a shot to the head. 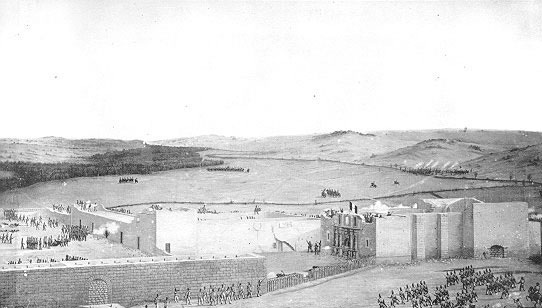 The rest of Santa Anna's columns continued the assault while Perfecto de Cos's men flooded into the fortress. Alamo's defenders were spread too thin to adequately defend both the walls and the invading Mexicans. 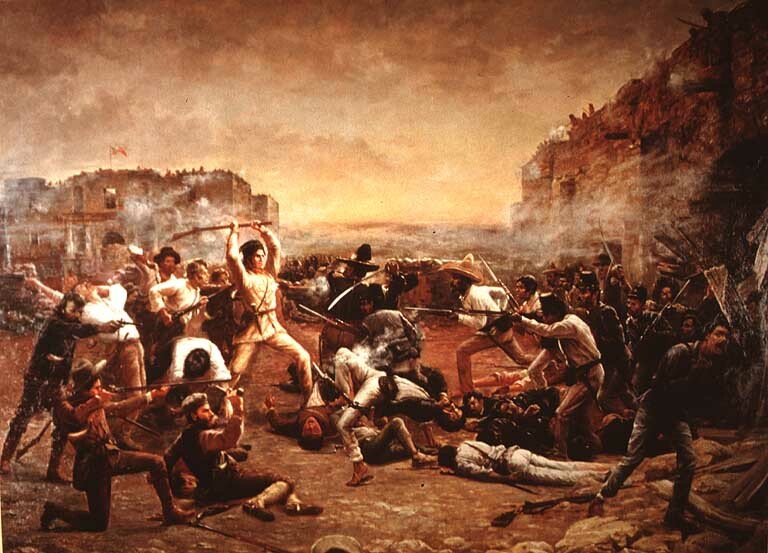 By 6:30 that morning, nearly all Alamo defenders had been slain in brutal hand-to-hand combat. Famous defender Jim Bowie is reported to have been bayoneted and shot to death in his cot. The battle, from initial assault to capture of the Alamo, lasted only an hour. 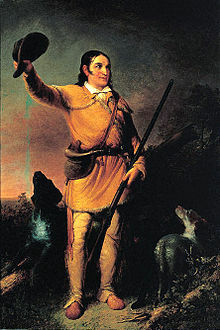 A group of male survivors were executed after the battle, including, it is claimed, Davy Crockett. Victorious Mexicans released two dozen surviving women and children, Bowie's slave Sam and Travis' slave Joe after the battle. Joe spoke of seeing a slave named John killed in the Alamo assault and another black woman killed. Another reported survivor was Brigido Guerrero, Mexican army deserter who had joined the Texan cause. He was able to convince the Mexican soldiers that he had been a prisoner held against his will. Henry Wornell was reportedly able to escape the battle, but died from his wounds three months later. (Right) Period portrait of the Alamo. "The Fall of the Alamo," painted by Theodore Gentilz in 1844, depicts the Alamo complex from the south. The Low Barracks, the chapel, and the wooden palisade connecting them are in the foreground. 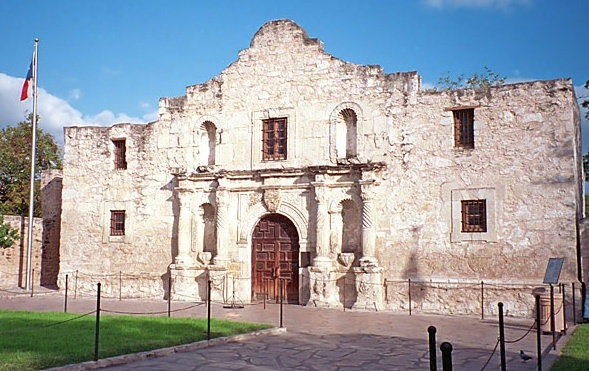 Texan: 183 to 250 Texan and Tejano bodies were found at Alamo after the battle; Santa Anna's official report dictated to his personal secretary Ramón Martínez Caro, stated 600 rebel bodies were found. Historians believe this to be a false claim. All but one were burned by the Mexicans; the sole exception being Gregorio Esparza, who was buried rather than burned because his brother Francisco had served as an activo who had fought under General Perfecto de Cos in Siege of Béxar. Texas declared independence on March 2. The delegates elected David G. Burnet as Provisional President and Lorenzo de Zavala as Vice-President. The men inside the Alamo probably never knew that this event had occurred. Houston still held his rank of supreme military commander. The Texan Army never numbered more than 2,000 men at the time of Alamo siege. Successive losses at Goliad, Refugio, Matamoros and San Antonio de Béxar, reduced the army to 1,000 men. April 21, at Battle of San Jacinto, Santa Anna's 1,250-strong force was defeated by Sam Houston's army of 910 men, who used now-famous battle cry, "Remember the Alamo!" Mexican losses for the day were 650 killed with 600 taken prisoner. Texan losses were nine killed and 18 wounded. Santa Anna was captured the following day, dressed in a common soldier's jacket, having discarded his finer clothing in hopes of escaping. He issued orders that all Mexican troops under the command of Vicente Filisola (1789–1850) and José de Urrea (1795–1849) were to pull back into Mexico. Legend has it that on March 3, 4, or March 5, Lt. Col. Travis drew a line in the sand with his sword inviting all those willing to stay, presumably to die, to cross over the line. Jim Bowie was carried across the line at his request. All but one defender crossed the line. Louis Rose, a French soldier who had fought under Napoleon in Russia before arriving in Texas, slipped out of the Alamo. He evaded Mexican forces by moving at night, then Rose took shelter with the family of William P. Zuber to whom he told the tale of his escape. In 1873, Zuber (his son) published a version of the story, which has not been historically documented. The phrase "drawing a line in the sand" has remained part of English, for taking a stand with no compromise. This account is narrated in Steven Kellerman's "The Yellow Rose of Texas," Journal of American Folklore. Before the war ended, Santa Anna ordered a red flag be raised from San Fernando cathedral indicating to the defenders inside the Alamo that no quarter would be given. According to José Enrique de la Peña's diary, several defenders who had not been killed in the final assault on Alamo were captured by Col. Castrillón and presented to Santa Anna, who personally ordered their deaths. Davy Crockett may or may not have been one of the six, since this is disputed. De la Peña states that Crockett attempted to negotiate surrender with Santa Anna but was turned down on the grounds of 'no guarantees for traitors'. There is little evidence to support this. Some believe that Crockett went down struggling to stay alive when he was spotted by Santa Anna's army after the 12 day struggle. Santa Anna reported that he had suffered 70 dead and 300 wounded, while many Texan accounts claim that as many as 1,500 Mexican lives were lost. While many quickly dismiss Santa Anna's account as being unrealistic, Texan account of 1,500 dead also lacks logic. Alamo historians agree that the Mexican attack force consisted of 1,400 - 1,600 men, a count of 1,500 sounds improbable. Commonly acceptable accounts by historians are the ones that place the number of 200 and number of initial Mexican wounded at 400. These losses, (43 percent casualties) would have been considered catastrophic by Mexican Army. See also: Battle of the Alamo and TEXAS HOMEPAGE: Texas Revolution; Texas Independence; Republic of Texas; Texas Annexation; Texas Statehood. From the war's opening in the "Come and Take It" incident at Gonzales to the capture of General Santa Anna at San Jacinto, Hardin clearly describes the strategy and tactics of each side. His research yields new knowledge of the actions of famous Texan and Mexican leaders, as well as fascinating descriptions of battle and camp life from the ordinary soldier's point of view. This in-depth coverage provides a balanced view of the Revolution that fairly assesses the conduct of both Texans and Mexicans. Texian Iliad belongs on the bookshelf of everyone interested in Texas or military history. Hardin has succeeded admirably in writing a balanced military history of the revolution, making an important contribution to the extensive body of work on the struggle that eventually led to Texas' becoming part of the United States. Though it is primarily the Alamo we remember today, the battle itself takes up just a few pages of William C. Davis's Three Roads to the Alamo; Davis is far more interested in what brought three such disparate men as Crockett, Bowie, and Travis to Texas in the first place than in how they died there. As any schoolchild knows, Davy Crockett was the "king of the wild frontier," a bona fide folk hero in his own time who rode his legend to political office first in Tennessee and then as a United States congressman. Bowie was both less well known and less heroic--a land speculator not above resorting to fraud and forgery to get what he wanted, while William Travis, the youngest of the three, brought little but potential with him to Texas. Davis does a good job of illuminating both the personalities of his subjects and the situation in which they found themselves in Texas. He thoroughly explores the lives of these three men--their successes, their failures, their hopes for the future--and lays out the arguments for and against Texan independence from Mexico in which they found themselves embroiled. By the time Crockett, Bowie, and Travis finally arrive at the Alamo, it seems the inevitable conclusion to the roads they each have been traveling over the course of their lifetimes. Three Roads to the Alamo is a fine piece of historical research and an entertaining read, as well. The cast of characters includes not only famous figures like Jim Bowie but unknown, unsung men: John Purdy Reynolds, the wandering Pennsylvania surgeon; George Kimball, the industrious New York hatter, Micajah Autry of Tennessee, who was a far better poet than a businessman. And then there are the Mexicans: the fabulous Santa Anna; the smooth Colonel Almonte; the forlorn private Juan Basquez, who only wanted to stay home and make shoes. About the Author: Walter Lord is the author of such bestsellers as A Night to Remember, Day of Infamy, and The Good Years: From Nineteen Hundred to the First World War. Recommended Reading: The Alamo (Bison Book). Description: "The majority of the stories of the Alamo fight have been partly legendary, partly hearsay and at best fragmentary. It has been left to John Myers Myers to present an exhaustively researched book which reveals the chronicle of the siege of the Alamo in an entirely different light...Myers' story will stand as the best that has yet been written on the Alamo...It's a classic. "-Boston Post "Here is a historian with the vitality and drive to match his subject. A reporter of the first rank, he can clothe the dry bones of history with the living stuff of which today's news is made. "-Chicago Tribune John Myers Myers authored sixteen books, including Doc Holliday and Tombstone's Early Years, also available as Bison Books. But the truth was lurking all along, in old sketches, plats, diagrams, and later archaeological digs. Now for the first time, all of the available sources have been meticulously consulted and brought together to create the most accurate illustrated book on the true appearance of the Alamo in 1836 ever produced. The reader is taken through the entire compound, inside and out, room to room, and shown areas never before depicted. For clarity, the compound is divided into sectors, each chapter covering a sector, which is then explored in detail. Through extremely realistic photo-illustrations, as well as dramatic original artwork with explanatory text, the author breathes new life into the 1836 Alamo, and makes it real. Scholars, students, artists, and readers of history all will find this a fascinating journey back in time. About the Author: Thomas Ricks Lindley is a former Army military policeman and criminal investigator. He has published numerous articles in The Alamo Journal, the publication of The Alamo Society. Currently working on a manuscript about the relationship between Sam Houston and Andrew Jackson, the author resides in Austin, Texas. From the Publisher: Highly visual guides to history's greatest conflicts, detailing the command strategies, tactics, and experiences of the opposing forces throughout each campaign, and concluding with a guide to the battlefields today. Barr, Alwyn (1996), Black Texans: A history of African Americans in Texas, 1528–1995 (2nd ed. ), Norman, OK: University of Oklahoma Press; Chariton, Wallace O. (1990), Exploring the Alamo Legends, Dallas, TX: Republic of Texas Press; Edmondson, J.R. (2000), The Alamo Story-From History to Current Conflicts, Plano, TX: Republic of Texas Press; Glaser, Tom W. (1985), Schoelwer, Susan Prendergast, ed., Alamo Images: Changing Perceptions of a Texas Experience, Dallas, TX: The DeGlolyer Library and Southern Methodist University Press; Groneman, Bill (1990), Alamo Defenders, A Genealogy: The People and Their Words, Austin, TX: Eakin Press; Groneman, Bill (1996), Eyewitness to the Alamo, Plano, TX: Republic of Texas Press; Groneman, Bill (1998), Battlefields of Texas, Plano, TX: Republic of Texas Press; Hardin, Stephen L. (1994), Texian Iliad, Austin, TX: University of Texas Press; Hopewell, Clifford (1994), James Bowie Texas Fighting Man: A Biography, Austin, TX: Eakin Press; Lindley, Thomas Ricks (2003), Alamo Traces: New Evidence and New Conclusions, Lanham, MD: Republic of Texas Press; Lord, Walter (1961), A Time to Stand, Lincoln, NE: University of Nebraska Press; Manchaca, Martha (2001), Recovering History, Constructing Race: The Indian, Black, and White Roots of Mexican Americans, The Joe R. and Teresa Lozano Long Series in Latin American and Latino Art and Culture, Austin, TX: University of Texas Press; Myers, John Myers (1948), The Alamo, Lincoln, NE: University of Nebraska Press; Nofi, Albert A. (1992), The Alamo and the Texas War of Independence, September 30, 1835 to April 21, 1836: Heroes, Myths, and History, Conshohocken, PA: Combined Books, Inc.; Petite, Mary Deborah (1999), 1836 Facts about the Alamo and the Texas War for Independence, Mason City, IA: Savas Publishing Company; Schoelwer, Susan Prendergast (1985), Alamo Images: Changing Perceptions of a Texas Experience, Dallas, TX: The DeGlolyer Library and Southern Methodist University Press; Scott, Robert (2000), After the Alamo, Plano, TX: Republic of Texas Press; Tinkle, Lon (1985), 13 Days to Glory: The Siege of the Alamo, College Station, TX: Texas A&M University Press. Reprint. Originally published: New York: McGraw-Hill, 1958; Todish, Timothy J.; Todish, Terry; Spring, Ted (1998), Alamo Sourcebook, 1836: A Comprehensive Guide to the Battle of the Alamo and the Texas Revolution, Austin, TX: Eakin Press.